Spiced and sweet nuts are my absolute favorite snack at any holiday or party. 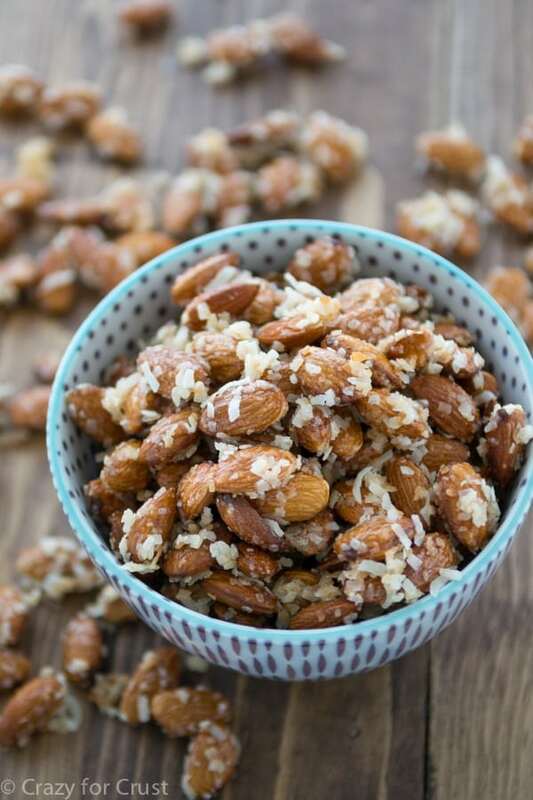 These Coconut Almonds are my new favorite addiction – savory nuts are coated in sweet coconut. I’m pretty sure they’ll be your favorite new snack too. And they’re the easiest thing to make, so you can have them in no time at all. If I were you, I’d be pretty darn happy to know me right now. I love Trader Joe’s. It’s one of my favorite grocery stores and I could probably spend hours in there looking at every single little thing on every shelf. It’s probably good that our TJ’s is (1) some distance away and (2) always so crowded that “looking” at anything is a novelty. Most often, it’s reach-and-grab and get out of the way. On my last excursion to TJ’s (I say it like it’s so far away – it’s really only about 15 minutes but it feels so much longer) I picked up a bag of these bad boys: Coconut Cashews. My mind was blown. I went to town on the bag and literally made myself sick on them. Cashews are rich, didn’t you know? Anyway I ran out of them and wanted more. But I wasn’t planning to go to Trader Joe’s anytime soon, so I made my own. But I used almonds because (1) cashews cost more than my car and (2) if I wanted to get cheap cashews I’d have to go to TJ’s and then I’d just get the real thing. I always have almonds in my pantry. And they’re healthier and less fatty than cashews. Plus coconut with almond reminds me of Almond Joy. That there is why you love me. Mixed nuts (or nuts of any kind) are one of my favorite things to make because they’re so good, everyone loves them, and they’re so easy. This recipe is no exception. It has only 3 ingredients: Coconut, Almonds, and Honey (or agave or maple syrup). The method for this recipe is actually one I’ve used for years to make sweet and spicy walnuts at Christmas. That recipe is from one of the earliest issues of Rachael Ray magazine. Basically, you toast your nuts, add them to the sweet sticky binder (honey, in this recipe) and then top them with the coating. 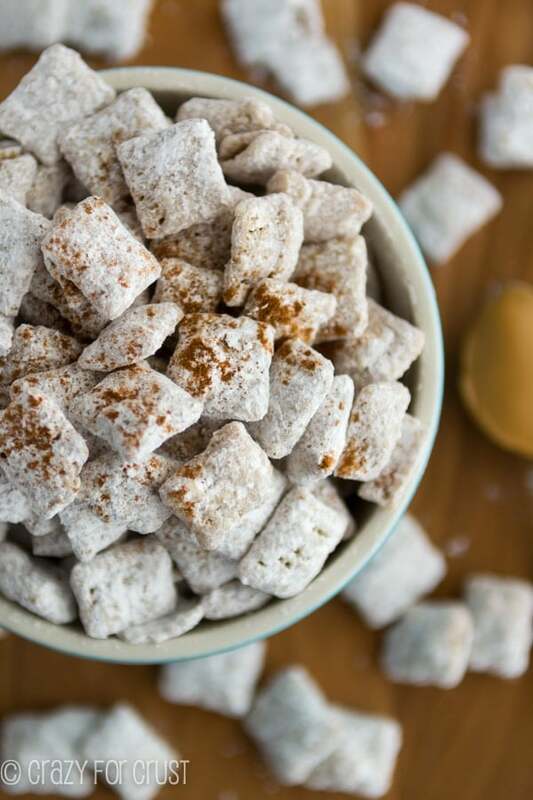 I keep meaning to post the original recipe at the holidays, but until we get there, you can make these. The Coconut Cashews from Trader Joe’s have a crunchy coconut coating. To try and replicate that with regular pantry ingredients, I toasted my shredded sweetened coconut before coating. Warning: be sure to watch coconut very carefully when you’re toasting it. You can do it in the oven but I recommend you do it on the stove so you can watch it more closely. It won’t be toasted, won’t be toasted…then it’ll be burnt. And believe me – burned coconut makes your house smell horrible. So…just watch it. Once the nuts are all coated in their coconut jacket, you lay them out on a cookie sheet to dry. Try to get them in a single layer and after an hour or so move them around a bit. After a couple of hours you can transfer them to an airtight container. They won’t be super sticky, but they won’t dry 100%. 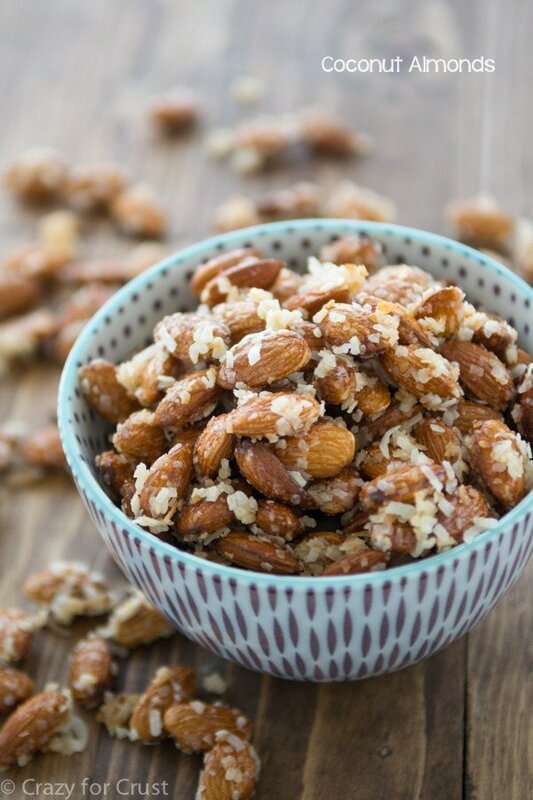 The coconut adds a great compliment to the almonds and makes them more fun to eat. And if almonds aren’t your thing, you can use this same recipe with your favorite nut. I can’t wait to use cashews, macadamias, or pecans. All three would make me very happy at my next party. If you’re ever at one of my parties and can’t find me, come look by the mixed nut bowl. That’s where I’ll be hiding (and hoarding all the pecans and brazil nuts). And now, you can add coconut almonds to that list. Place the coconut in a large frying pan over low heat. Stir often until the coconut begins to turn golden, then stir constantly until most of the coconut is a golden color. Immediately remove from heat to a bowl to cool slightly. Be really careful when toasting the coconut - it burns very fast and burned coconut smells really bad! Place the cooled coconut in a food processor and pulse until small shreds remain. Set aside. Preheat oven to 350°F. Place almonds on a cookie sheet lined with parchment paper or a silpat baking mat. Bake until toasted, about 5 minutes. Do not walk away from the stove, keep an eye on them. While the almonds are toasting, place the honey (or agave or maple syrup) in a large bowl. 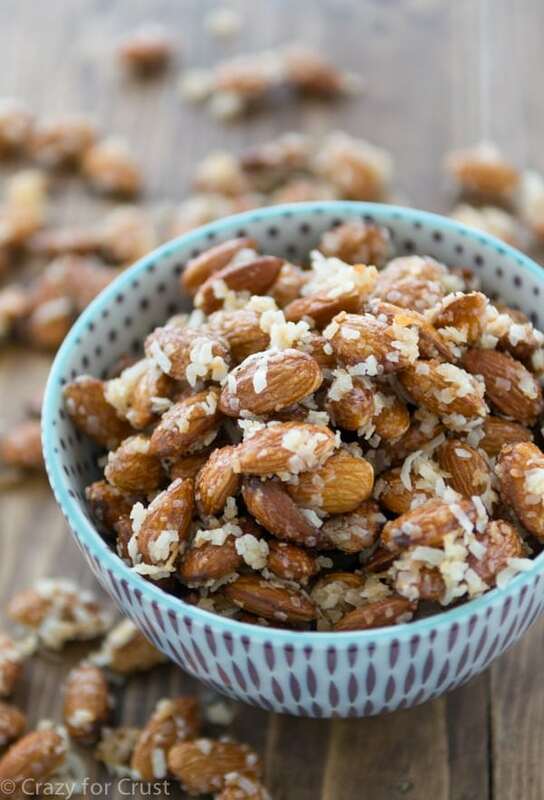 When the almonds come out of the oven, immediately place them in the bowl and stir until they're all coated with the syrup. Sprinkle the coconut over the top and stir again to make sure they're all coated. Spread the almonds in a single layer on the cookie sheet and let dry for at least 2 hours, breaking them up as needed. They'll stay somewhat sticky but not clumpy once they've set. Hahaha. Cashews really do cost more than your car. This look suspiciously like a healthy almond joy…I’m okay with that. I could snack on these all day long! So delicious! I went into a TJ’s for the very first time only 2 years ago! After a few hours, Paul sent me a text and asked if I got lost. I joked “Ya, I’m still on aisle 4.” I love that place! It’s not really close to my house, either, so I consider it an extra special occasion when I go. Anything coconut FTW. Love these. Oh my and this is why I love your recipes! I am obsessed with those cashews from TJ’s but don’t buy them often because YES – they DO cost more than a car haha. 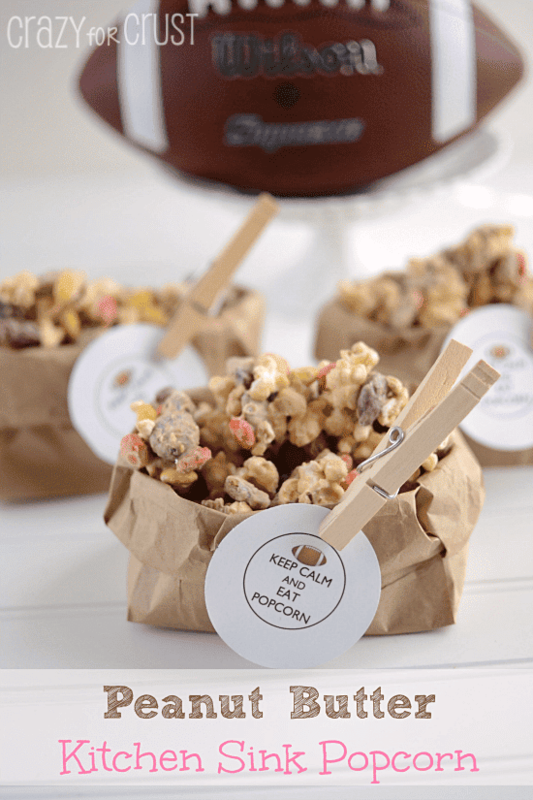 Love love love your almond version and can’t wait to try it – pinned! Thanks for the pin Kelly!! oh man, these look amazing!! Seriously, like eating the inside of an almond joy! mmmmm. And only three ingredients?? Even better! Trader Joe’s is the best! But I hate that it’s always crowded and you can’t spend time looking at things. 🙁 But these almonds look delish. What a fun, easy, snack! Thanks for sharing! 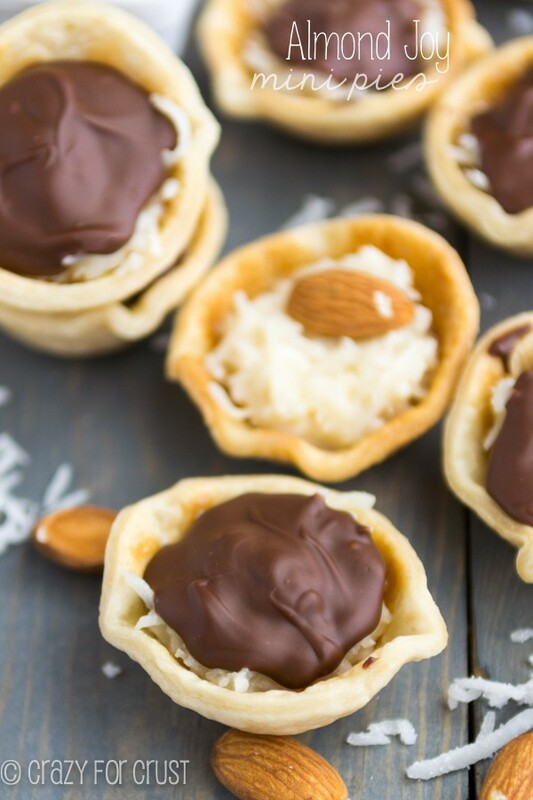 These are delicious and so quick and easy to make! Yum!